A Female Kyrgyz folk dress. Home » A Female Kyrgyz folk dress. THE head-dress of the Kyrgyz females of distinction consists of a large piece of thin stuff, folded in the form of a turban: their robes are of silk, painted linen, and fine cloth, but more frequently of velvet; they are trimmed with gold lace and with the richest furs. 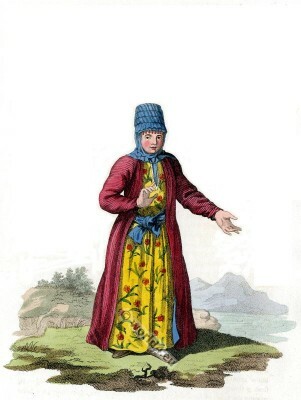 The women of the lower order constantly cover their heads with a veil; but on holidays they wear bonnets trimmed with tassels, and beads of coral. The single women leave the head uncovered, and plait the hair into a variety of braids. The Kyrgyz purchase their wives. Those in easy circumstances gene-rally pay fifty horses, twenty-five cows, a pair of camels, and a hundred sheep. Ile who has already one wife, pays dearer for the second, and still more so for the third. The common people have only one wife, and this one they would often find it difficult to procure, if they were not to steal them from the neighbouring nations. The rich have generally four, besides a number of concubines. Every wife has a separate tent, and is charged with the education of her children. The Kyrgyz women are industrious, tender, and compassionate. It was not till the beginning of the seventeenth century that the Kyrgyz embraced Mahometanism. They hold their religion in great veneration; but as they have no public schools, and, in many of their districts, are unprovided with Moullahs, they continue extremely ignorant, and abound in superstitious notions. Their Moullahs are generally selected from among the Tartar prisoners who arc able to read and write; and though they arc often taken from the plough, and from the most menial occupations, respect is, nevertheless, paid to their learning, and their fortune is secured. The Kyrgyz, in renouncing their religion, have, however, preserved their magicians. These impostors set themselves up for astrologers, chiromancers, and interpreters of dreams. They pretend to raise and drive out evil spirits by the sound of their tambour; to prevent barrenness in women and in cattle, and to cure all sorts of disorders by means of their delusions. In their funerals the Kyrgyz confound the ceremonies of Mahometanism with those of Shamanism. They tear the best garment of the deceased into a variety of pieces, and distribute the relics to his friends. if he happens to have been a person of consideration, his memory is celebrated three times, during the year of his decease: his wife and children come each time to weep over his tomb, and his friends repair to it, dressed in their richest apparel: au eulogy on their departed friend is then delivered, and the solemnity concludes with a repast from which sadness is banished. Each district celebrates, once a year, a festival in honour of the dead. The inhabitants assemble in their burial grounds, and a sacrifice of several horses is there made. Part of the flesh is thrown to the dead, and the remainder devoured by the living. In passing the tomb of a relative or a friend, they stop, and, snatching a few hairs from the mane of their horse, they deposit them on his tomb.